The dance lover that I am, I couldn’t wait to see the unique dance company from Taiwan, The Cloud Gate Dance Theatre, perform at the Power Center on Friday night. I had heard how uniquely beautiful their movement style is, due to their wide range of training in modern dance, classical ballet, tai chi, and Chinese opera movement. Though I was feeling a little under-the-weather, I pulled myself off of my futon and went to the show. The Power Center was packed, and not long after I found my seat the lights lowered and the curtain opened to reveal a white floor, tilted so that it was higher upstage, away from the audience, swooping gradually down to meet with the black Power Center stage, making it feel throughout the performance as if the dancers would roll right down into the audience. The dance began slowly, too slowly, as the dancers took small, careful steps out onto the stage, performing miniscule movements for the first long minutes of the performance to high-pitched, eerie music that hurt my ears. When I began to wonder where the breath-taking movement was that I had been promised of the Cloud Gate dancers, they exited the stage, the music still going, leaving us all to stare awkwardly at an empty stage, wondering uncomfortably when they’re coming back. Though I’m not sure I enjoyed or agreed with the choice to leave the stage empty for a few moments so soon in the performance, before I saw any real dancing, it did make sense in light of the overall concept of the piece, concerning Chinese calligraphy, and the white stage as a metaphor for the rice paper on which calligraphy is done. Throughout the piece there were dark “clouds” that rolled over the white floor, at various speeds and intensities, sometimes casting a shadowy grey color over the entire stage, and at other times frantically spinning black cloud-shapes over the stage as the dancers jumped and rolled on the floor in equal speed and intensity. The empty stage gave us the opportunity to appreciate this unique staging choice. The dancers soon re-entered and the performance continued. Though there were many clear exits and entrances, breaks and shifts in the music, as well as in the style of dance–ranging from impressive slow, controlled movements of the arms cutting through space, to quick, frantic leaps and falls, rolling on the ground–these pieces flowed easily from one to the next, blurring the lines between one section of choreography and the next. 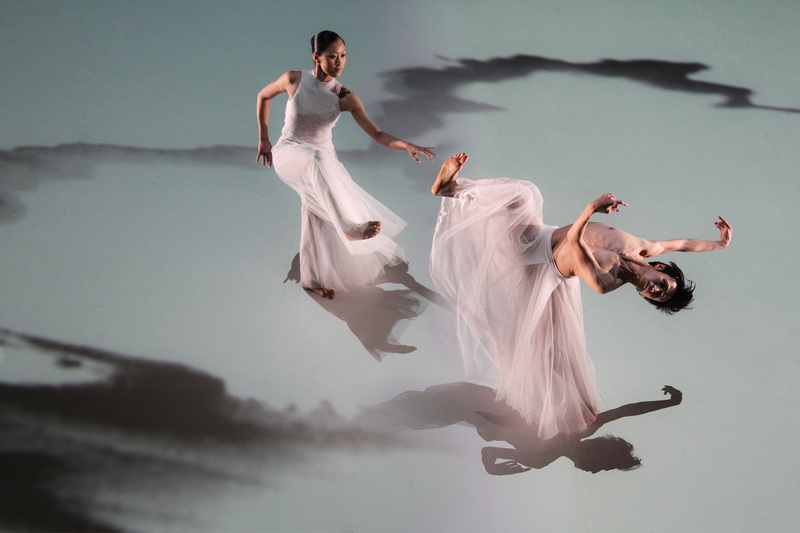 Though I felt there was some story to the piece, something possibly concerning cultural history, gender, and sorrow, this story was incredibly abstract, and anything but clear, so is often the case with modern dance. Regardless of what the choreographer was intending to communicate through the movement, the piece was certainly a unique expression, with the white floor, and uniform white costumes, contrasting with the black forms projected onto the floor, and the often eerie music and mood. Now, the ballet-trained dancer in me couldn’t help but critique the repeatedly sickled (turned-in), flexed feet, obviously a choice made by the choreographer, but annoying to me nonetheless. Maybe it’s the result of years of being told how great a sin it is to sickle your feet in ballet, but it still just looks ugly to me! I was also disappointed at the limited range of movement used in the piece. Though I am aware that dance as an art form isn’t all about doing big leaps and turns and fancy moves that impress the audience with your technique, I had heard so much about the control and expertise of these dancers’ movements, and I felt like they were capable of so much more than the choreography allowed them to show us. I felt that the movement was very repetitive, abstract, and contained. That said, I thoroughly enjoyed the performance. It was refreshing to see dance again–I miss it so much! Hearing the breath of the dancers in moments when the music was quiet, hearing their feet landing on the stage as they jumped and traveled across the floor… music to my ears. The Cloud Gate dancers are truly amazing dancers, technically and artistically. And thankfully, the performance lasted only about an hour, so I was able to go back home to my futon and sleep off my sickness–perfection! Thanks for reviewing this performance – I really wanted to attend, but sadly couldn’t make it. It’s interesting to hear your perspective, as a dancer, and what you thought of the show. Speaking as merely a dance-observer, I sometimes feel I “don’t get it” when I see modern dance, so its good to hear you feel the same way too at times. Too bad that the movement wasn’t more freeing – I definitely imagined it would be dancers, leaping around, as if they were floating on, well, clouds. Interesting review – thanks! Thank you for the comment! 🙂 I’m new here, so you’re actually my first comment as an art seen blogger–awesome! I’m so glad to hear my review was helpful. You know, sometimes I think modern dance isn’t meant to be “got”, just absorbed and enjoyed, which I certainly did at this performance. Anyway, thanks again!